Backpacker jogja - Unknown clearly when Candi Borobudur is build. There is no also description of goods a few about kings who labours its, and who is the architect. Also became question how long time required and how to execute realized that building which so luxury and respects. On the basis of from guides from paleontology, historical science and paleography hence it is estimated that Candi Borobudur is build around year of 800 a.d. by king family Syailendra. Knowable also, that the temple design have ever experienced change, what executed time most of the building had stood. However, when completed its, still becomes mystery. In general can be told, that development a temple has intention to glorify king which has passed away, at the same time is real expression from circumstantial respect to the parents exaltus. 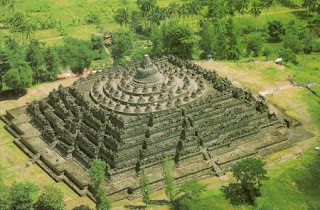 very attractive Borobudur Temple, its form as punden berundak-undak and the formation clarified with engravings depicts religion life opinion Budha. At mid of century 14 then, the news would existence of religion building Budha from stream Wajradhara by the name " Budur" . For Absense Of other Budur hence it is of course so-called in book Negarakertagama numerical Empu Prapanca masterpiece of the year 1365 a.d. is Borobudur. However the news at the most the naming of name only, so that about clarity of the unknown history. Backpacker jogja - There is storys relating to this Candi Borobudur, according to book " Babad Tanah Jawi" in 1790 a.d there is a figure so called Ki Mas Dana, the daugter;son in law from Ki Gede Paculikan, what rebels to King Amangkurat III having throne in Kartasura. The rebel go to the wall, then runs away to hill Borobudur. Empire commander, prince Pringgolaya performs a pursuit. Hill Borobudur is confined, Ki Mas Dana catched and brought to kartasura then serves time death. In book " Babad Mataram" told that in the year 1757 a.d. sultanate Crown of Yogyakarta which so called Pangeran Mancanagara experiences mischance also in Borobudur. For him’s applies abstention to see arca in Borobudur, because one of arca depicts a satria which shut-in in hutch. On the contrary exactly The prince will see arca, as of the return in Istana falls sick and blood puking, finally, he dies. The above is true, during approximately nine centuries , since forming of estimated around year of 800 up to 1700 a.d., Temple Borobudur is covered up by history darkness screen.